Bill Rennison was a founder member of and Treasurer to THS, author of articles and an invaluable Historical Reference Book. In his spare time, he was a Scout Commissioner, Mayor of Tewkesbury and voluntary gardener at Bredon Manor. Much of that was achieved in his fulfilling retirement; all shared and enjoyed by his wife and consort, Ruth. He was probably the last of the generation of teachers who managed to combine a demanding career with civic service in their 'spare time'. Bill was officially known as ‘Jared William’ when he was born in 1929 – named after a grandfather who paid for his difficult birth in a private clinic. Bill’s father was a shipyard worker who survived the slump - and saved up for marriage – by working for a year in Venezuela. His father took the family to work in railway engineering in Doncaster where Bill was reared. There he thrived and one of his Grammar School teachers encouraged him to apply for a place to read History at Oxford. At a time when not many children from Doncaster went to University, let alone Oxbridge; as Peter commented, “he certainly did his bit for social mobility”. However, in 1947 an 18 year’s enforced priority was National Service which he spent – possibly because he had been a Sea Cadet - working in Haslar Naval Hospital in Portsmouth. He then entered St John’s College where his passion for history flourished. It was during this time that he met Ruth - a New Zealander who had sailed over “looking for adventure”. They were introduced and the rest, as they say, was history. They married in Newcastle, after a spell of teaching in Scotland and Huddersfield, where he had to teach French. In his memoirs, the late Gordon Kaye, star of 'Allo, Allo' recalled that it was Bill who provided him with his first French lesson; and the rest was “Franglais”! They enjoyed their early married years teaching in Cambridgeshire where Janet was born in 1957 and Peter in 1960. It was in 1967 that Bill won promotion as Second Master at Tewkesbury Boys’ Grammar School in what was to be its final five years at Southwick Park. 1972 was a year of educational revolution when Bill moved to the new comprehensive school as head of Upper School and of course teaching history where I met him as the 'Head of Department' in 1983. He retired in 1985 and I remember celebrating with them, dining on a river boat on the Avon. During this time he and Ruth were keen leaders of the Scouts and Guides and he was a member of the Tewkesbury Choral Society. If this was not enough service, he was a Councillor being elected Town Mayor in 1979. 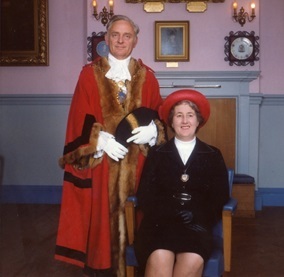 Both he and Ruth thoroughly enjoyed their civic duties but, as a principled Liberal politician, he resigned from the party in 1997, disagreeing with the proposed, but ill-fated, 'Lib-Lab Pact', which Tony Blair saw as a means of obtaining power. At its foundation in 1991, this Society was fortunate to be supported by Bill who rotated as treasurer with his neighbour, Bill Camp – they proved very safe hands in those pre-computer days. Bill also teamed up with Cameron Talbot to use their precious skills as Latin scholars – a pre-requisite then for entry to Oxford – to transcribe 16-17th century wills, written in Medieval Latin. These have been preserved as a bound volume in the Library and transcribed onto the Society’s database for the benefit of posterity. Ruth looked after me with her famous Pavlovas and it was a sad loss when she died at so young an age - and just before the 2007 floods which so afflicted him. Shortly afterwards, he left Tewkesbury for a comfortable retirement home in Reading. It was an honour for me to represent the Society, and join Bill and Ruth’s family at the funeral in Reading of this Life Member - and to learn that he had settled so well in his adopted area, partly because his love of choral music had even extended to a “Groovy Kind of Love”.